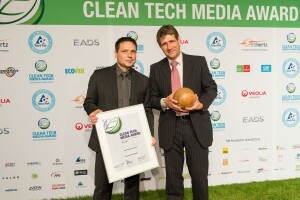 September 7th 2012 Berlin: Munich-based Smart Hydro Power (SHP) won first place in the category “energy” at the Clean Tech Media Award (CTMA) gala. The “energy” category considered technologies of solar, wind, water, and geothermal power, as well as efficiency technologies. The 37-member jury panel, an impressive and eclectic mix of celebrities, corporate executives, and scientists selected SHP as the winner out of 25 applications. The main driver behind the “energy” category is the alignment of technological advancement and environmental preservation. Other factors include, but are not limited to: the degree of innovation, economic efficiency, and long-term applicability. Dr. Karl Kolmsee, founder and CEO of SHP accepted the award on Friday night in Berlin´s Tempodrom from journalist and TV presenter, Sabine Christiansen and Boris Schucht President of 50Hertz Transmission Ltd. Initiator of CTMA, Marco Voigt fully supports SHP: “it is hard for us here in Germany to imagine that there are still people in the world without access to an established public grid. Smart Hydro Power´s micro hydro turbine is a solution for this problem. The project shows how essential it is to support environmental technologies in all areas…” The non-profit event CTMA is in its 5th year of recognizing and presenting the latest advances in clean tech with the mission of raising public awareness via increased media publicity. By organizing the annual, high profile award gala, CTMA successfully connects entrepreneurs, politicians, scientists, artists, media representatives and consumers – increasing the popularity and visibility of innovations in clean tech.